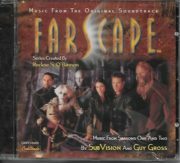 From the exciting hit sci-fi television series that aired on the sci-fi channel comes the soundtrack cd. Distribution was limited and it is now out of print, so you may not be able to find this cd elsewhere. This is a mint, original shrinkwrap, never played music cd containing over 70 minutes of music from the original soundtracks of the first two seasons. Published in 2001 by Titan Books in Great Britain, this is a 1st printing of this trade paperback. 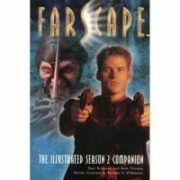 This is a comprehensive episode-by-episode guide to the second season of the hit sci-fi TV show Farscape. This is an 8″ x 10″ photograph of Capt. 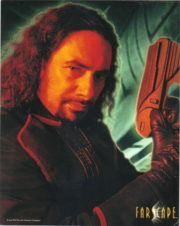 Bialar Crais from the hit sci-fi TV series Farscape. 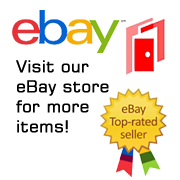 This is a black t-shirt bearing the image of the cast from the Sci-Fi Channel’s popular science fiction TV series, Farscape, and titled Criminally Epic. This is a new, never worn t-shirt. This is a black t-shirt bearing images of the character of Chiana from the Sci-Fi Channel’s popular science fiction TV series, Farscape. This is a new, never worn t-shirt. 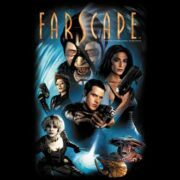 This is a black t-shirt bearing the comic art of the cast from the Sci-Fi Channel’s popular science fiction TV series, Farscape. It is the cover to the Boom Studios comic #1, cover A. This is a new, never worn t-shirt. 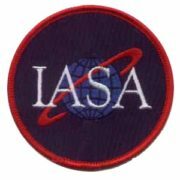 Now you can own the patch of the logo of IASA, as seen on the Earth uniforms, from the hit sci-fi TV series Farscape. This mint patch measures 3″ across, and is worn by Crighton. 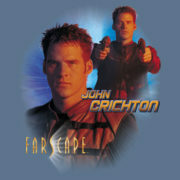 This is a slate blue t-shirt bearing images of the character of John Crichton from the Sci-Fi Channel’s popular science fiction TV series, Farscape. This is a new, never worn t-shirt. 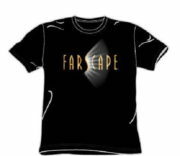 This is a black t-shirt bearing the name logo from the Sci-Fi Channel’s popular science fiction TV series, Farscape. This is a new, never worn t-shirt. 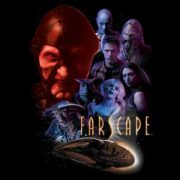 Now you can own the patch of the logo from the hit sci-fi TV series Farscape. This mint embroidered patch measures 3.5″ across. This is a grey t-shirt bearing the images of Jool, Aeryn and Chiana, from the Sci-Fi Channel’s popular science fiction TV series, Farscape. This is a new, never worn t-shirt, now out of print.